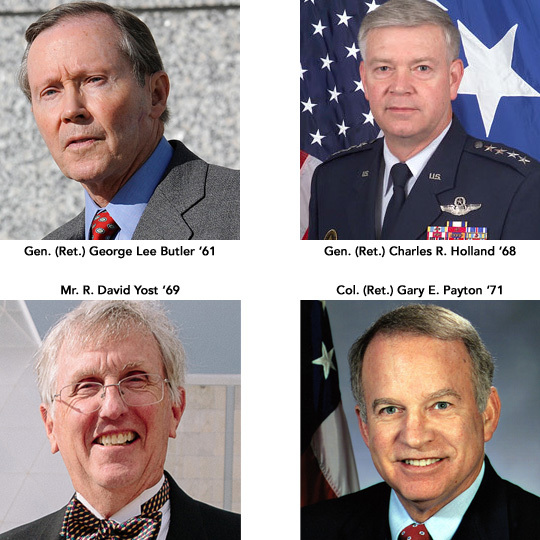 The United States Air Force Academy and the Association of Graduates are proud to announce the Distinguished Graduate honorees for 2016. Gen. (Ret.) George Lee Butler, Class of 1961; Gen. (Ret.) Charles R. Holland, Class of 1968; Mr. R. David Yost, Class of 1969; and Col. (Ret.) Gary E. Payton, Class of 1971, will receive their awards at the annual Founders Day banquet Friday, April 7, at the Air Force Academy. Since graduating from the Academy in 1961, Gen. Butler (Laguna Beach, California) built an impressive military and post-military resume. Among his many accomplishments during his career, Butler helped transition the Air Force’s Strategic Air Command into the Joint Forces’ Strategic Command. During his tenure with that organization, he was responsible for the Air Force’s and Navy’s strategic nuclear assets. Following his military service, Butler became a vocal advocate for global nuclear arms reduction. Butler has remained connected to his alma mater, delivering many speeches to cadets and donating hundreds of thousands of dollars to benefit USAFA, current cadets and the Association of Graduates. During his 35-year military career, Gen. Holland (Tampa, Florida) advanced to become commander of the U.S. Special Operations Command during Operations Enduring Freedom and Iraqi Freedom. Previous to that, he commanded and led special operators in combat in Southeast Asia, Bosnia, Panama, Iraq, Kuwait and Afghanistan while in the Air Force. Since retiring, Holland has served as director or advisor on multiple corporate boards and has acted as a consultant for several companies, including the USAF. Yost (Bryn Mawr, Pennsylvania) served in the Air Force for five years before transitioning into a highly successful business career. He would become president and chief executive officer of AmerisourceBergen, one of North America’s largest distributors of pharmaceuticals and related products. Yost remains a dedicated supporter of the Academy, its current cadets and the graduate community. He serves on the USAFA Endowment Board of Directors and has given generously of his time, talent and financial resources to advance the mission of the Academy. Payton (Colorado Springs, Colorado) is currently professor of astronautics at the Air Force Academy. He received the USAFA Outstanding Academy Educator Award in 2014. Payton would spend four years as an instructor pilot for the Air Force before beginning a variety of positions with the U.S. space program. He would go on to serve as the payload specialist for the Space Shuttle Discovery launch in 1985. He would later serve as deputy for technology with the Ballistic Missile Defense Organization and then become director of the Strategic Defense Initiative. After retiring from the military in 1995, Payton went on to new challenges in the private sector. He would go on to become the deputy undersecretary for the Air Force’s Space Programs. The Academy and AOG have selected Distinguished Graduates each year since 2001. The award recognizes alumni who have set themselves apart by making significant contributions to our nation and their communities.